When we say something or perform any action, it gives a reflection of our thoughts. We first thinks and then he acts accordingly. Hence the importance of thinking big is quite evident. A man's success is not measured by his wealth or residence but by his thinking. 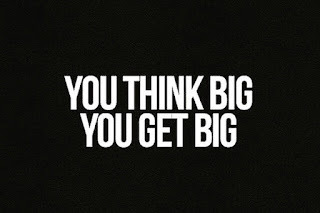 So think like a winner if you want to win in any field of life. Simply gazing at the sky won't take one to the sky. But gazing at the sky followed by thinking (how to reach the sky) will one day get him to the sky. Thinking inspires seeking, striving and struggling. Struggling lead to achieving the goal. So the more one thinks the more he gets; the more one ponders over the more he unearths. Deep thinking dredges out the depth. So long Lord Buddha was the King Sidharth. (not a man of reasoning) he was an ignorant man - not knowing what was death: what was disease etc. But his deep thinking at length led him to establish himself as Lord Buddha. Essay on "A River In Flood"
Last year I was in Calcutta during the summers. As the rainy season drew near, it started raining heavily for many days on end. So the water level in the river Ganga began to rise and soon it was in flood. Soon the water began to overflow the banks. 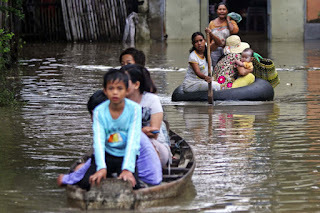 When we heard of the flood, we, under the organization of a voluntary social welfare society 'Help' planned to visit the flooded villages. It was terrible. There was water everywhere. The current was strong. Men and animals struggled between life and death. Many things were seen floating in the water. Live snakes were seen being washed away. Here and there we could see the carcasses on the surface of the water. Water seemed to be devouring all. Some villagers climbed up the trees to save their lives but they had nothing to eat or drink. Their condition was very miserable. We tried hard and threw some packets of food from the aeroplane and even saved some people. The flood caused great havoc. Many houses collapsed and many people lost their home. A large number of trees were uprooted. Traffic remained dislocated for weeks together. Crops were completely destroyed. As the means of communication were all under water, therefore access was possible only by boats. Many people met a watery grave. After three days, the flood began to subside. The people felt relieved. The government also rose to the occasion and began to help the people. Loans were given to the victims for building their houses and purchasing cattle. Many rich people donated large sums of money. The homeless were given temporary accommodation in schools, Dharamshalas, etc. As an epidemic was feared, preventive measures were taken and people were inoculated against cholera. The victims could start a normal life again after two or three months. But they could never have forgotten these horrible experiences which, for the time being, completely checked the normal flow of life. I often heard people talking about their flight in an aeroplane. 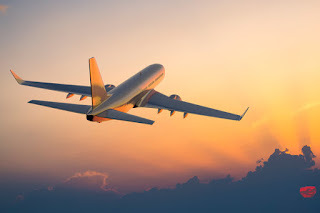 I often saw aeroplanes hovering about the sky. How I wished, I too could enjoy a flight in an aeroplane! Fortunately, I had an opportunity very soon. My father had gone to Bombay on business. One morning I received a sudden and immediate call from him. He wanted me to reach Bombay with some very important papers which he had forgotten to take along. I hurriedly collected the documents and a suit of clothes. I packed these things and dashed to the airport. Luckily I got a seat in the plane that was bound for Bombay. In my heart of hearts. I was very happy to have got this chance. The pilot started the engine. It made a great noise and immediately took off. At last, it glided along the ground and then began to ascend from the earth. In a few minutes, I found that we were very high up in the sky. In the first few minutes, I felt a little frightened. But soon I overcame my fright and felt easy. I looked below The scene was charming. The houses looked like small huts or even like matchboxes and crops seemed like grass very like the Gulliver's sight in Liliput. Men and women looked like ants and rivers like serpents crawling on the ground. Everything looked very small and tiny. I enjoyed the sight to the core. We remained in the air for hardly half an hour. It was 7 pm. Searchlights showed that we were near the Bombay airport. All of a sudden the deafening sound ceased. The plane began to descend. Soon it touched the ground and came to a standstill. I opened the belt that I had fastened before we took off and came out. The whole experience now seems a Wonder. In thirty minutes. I was a hundred miles away from home. It was really thrilling. Its memory is still fresh in my mind and I very much wish to fly over a longer distance. The rewards one gets in life are usually the results of one's efforts. No man can hope to have a very easy life and also at the same time a very successful one. There may be only one or two exceptions in thousands of cases in this matter. It is astonishing what intelligent efforts can achieve it is when channelized in the right direction. Had success been easy, everyone would have been successful. However, the path to success is not as difficult to climb as it might appear. Each time we overcome an obstacle, the work we are attempting becomes easier. It is very necessary to work hard to achieve success But psychologist say that if we love our work, we will never find it hard or tiring. 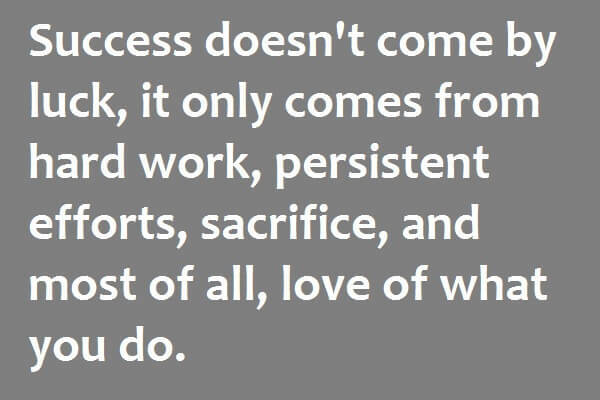 There is no substitute for hard work. At the same time, there should be a purpose and a noble goal at which to aim and advance. We must decide our aim in life or what we want most out of our lives and then constantly work for it. The early attempts towards the goal of success are the hardest. The more our efforts get success, the easier it becomes to do so. In the end, it becomes our habit. 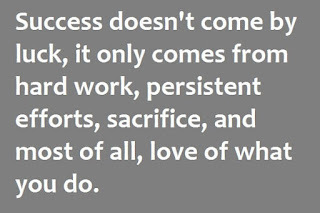 The success follows success. Nothing is impossible to a man who has a purpose and the perseverance to persist with it. Self-confidence, courage and strong will power are necessary to get success. It is not how much we do but how well we do that is important. But at the same time, one should also keep in mind that it is better to do something than to do nothing due to fear of failure. It is why courage is necessary to achieve success. In the ordinary business of life, the industry can do anything which genius can do. Genius is nothing but the quality of making persistent efforts in spite of facing thousands of failure. Fortune favors the brave. There is no gain without taking the risk. How a man who never ventures can win. In life, one has to take bold decisions quickly. Time and tide wait for nobody. The Timid, weak and undecided are swept away by the tide of time. Determination and concentration enable a man to attain success in any field of life. So success is not a matter of luck, it depends on firm determination and full preparation. Traveling is a great and inspiring experience. It is at once instructive and interesting. If we travel second class, a railway journey gives us a true picture of India. Majority of the Indians travel by second class. 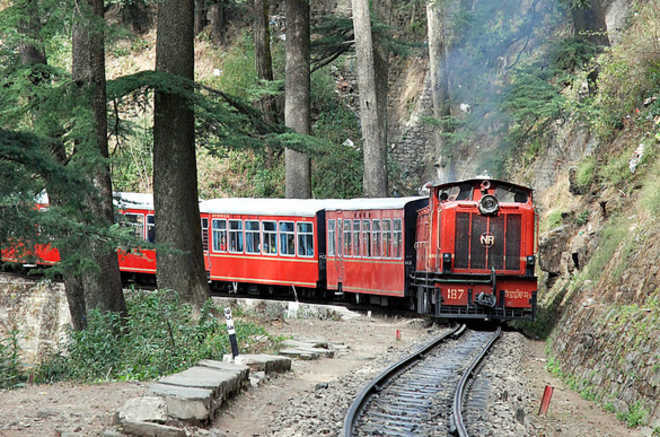 I had a great desire to go to Simla. I was very happy when I received a letter from my cousin to visit him during the summer vacation! My father gladly allowed me to go. It was the sticky month of July. The day at last arrived. Our school was closed for two months. I reached home. Packed up my articles and left for the railway station. I reached the station fifteen minutes before the arrival of the train. There was a great rush at the platform. I had no worries since I already had a reserved seat. I engaged a coolie and made my way to the train. There were a great hustle and bustle. The passengers were eagerly waiting for the train. After ten minutes, the train steamed in. It was fully packed. But I was lucky enough to get a seat near a window. After five minutes the guard whistled and waved his green flag. The train steamed off, soon it gathered speed. Our compartment was packed to its capacity. Some passengers were smoking while others were chatting or reading newspapers. Then the ticket checker entered and checked our tickets. A young man was found traveling without a ticket. He had to pay the fare and the penalty. I looked out of the window. There were greenfields on either side. Cattle were grazing. The trees seemed to be running away. At last, I reached Kalka. I took my lunch and changed for Simla. 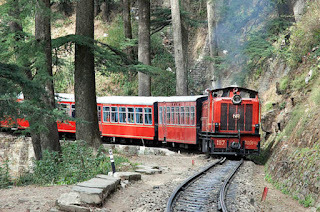 The train for Simla looked like a toy, It was an interesting sight to see the engine climbing the hill like a serpent. As the train went higher. I saw tall trees of pine. Houses on hills look very tiny. The train went on a zig-zag path. It passed through many tunnels. The cold increased as the train went higher and higher. After five hours of pleasant journey, I reached Simla. My cousin was waiting at the station and received me cheerfully. Previously a person took to begging only when he had been very hungry for days together and had not been able to get hold of a job. Nowadays begging in India has become almost a profession. Wherever you go, a beggar stares you in the face. You can't escape him. Besides meetings him in the street, at the bus stand and near the temple, you will find him begging from door to door. There are some beggars who are able-bodied. They can work to earn their bread but they have taken to begging simply because it is so easy. They at times get more than many honest workers. 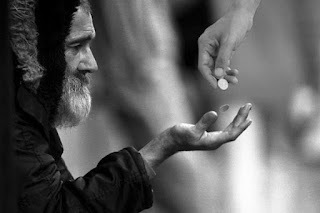 The beggars virtually loot money in the name of religion and God. They don't deserve pity. There are other beggars who are crippled. But it is no excuse for begging. A self-respectful person whether a handicap or not always tries to stand on his own foot. Of course, crippled people should be helped. but they should not be given alms. Begging, in no way, is justified. While giving alms to any beggar, one should always keep in mind that giving a little money or food will not end his poverty. If you want to really end his poverty you should give him work instead. Begging is a stigma on the name of the nation. Charity may be given but there should be poor houses for such disabled persons who really deserve charity. She is a religious lady. But her devotion to religion and God does not disturb the rest of the family. She is the first to leave her bed in the morning. Before we get up, she has already taken her bath with fresh water. Immediately after the bath, she goes to the nearby temple. We eagerly wait for her to come back for she brings sweets for us. Even at this age. she is very active and hard-working. At times, we are surprised at her agility. She supervises all the important jobs in the family. Some she does herself. She is very affectionate and caring. We, her grandchildren are attached to her more than to our parents. She never crosses with us. Her love for us is her passion. But she is equally generous to other children. My father and my uncle always seek her advice in all social matters. She is the most respected lady in our colony. Ladies, young and old, come to her for advice. Sometimes they bring their problems. In the afternoon many women flock around her. They feel flattered in doing her a little service. Sometimes she tells them her own experiences. They listen to her with respect. When we were little kids, our grandmother used to be such a source of joy! We used to wait eagerly for the night because, in the night, all of us snuggled near her and then she would tell us a story. 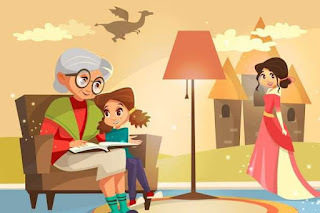 In this way, we learned some great stories of our scriptures like Mahabharat, Ramayan.Panchatantra etc. Like all old women, she has some orthodox habits but unlike other old women, she has a surprising quality to change with the time. Nobody forces her, but she herself has changed many of her superstitious habits. We all are thankful to God for such a loving grandmother.